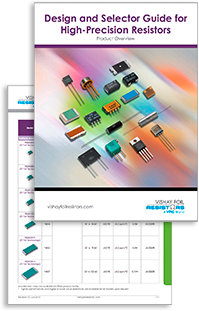 To provide you with a comprehensive view of resistor technology and the complete line of VFR Bulk Metal® Foil resistors, we present the latest edition of our Design and Selector Guide. Bringing together all the technical data you need to choose the best Bulk Metal Foil device for your application, our guide features the latest VFR products, selector guides, technical data, and a “VFR Resistors in Action” section showcasing a wide range of application examples. To download the 2015 edition of the Design and Selector Guide as a PDF, simply click the “Download” button. To receive a printed copy, please fill out the form below.